A serious crash shut Nene Parkway in Peterborough in both directions this afternoon. 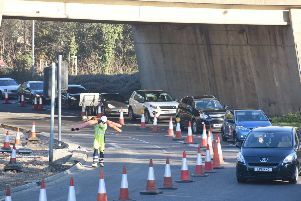 The northbound carriageway has been re-opened but police say the southbound carriageway will remain shut until further notice. Motorists are advised to avoid he area. The road has been closed from the A47 junction. Details of the crash and the injuries to those involved are not available at this time, but this website will be updated as we have more information. An eyewitness told the Peterborough Telegraph the incident involved at least two cars and multiple emergency services were in attendance near Longthorpe Parkway. UPDATE: The road reopened at around 5pm and traffic is flowing normally again. The crash took place at 3.10pm. Police are asking any witnesses or motorists with dashcam footage to contact them on 101 quoting log 0283 of 24th June.